Dragon Warrior I upcoming article. Dragon Quest IV release in Japan. News about Dragon Quest 6 coming out with revamped graphics. List of references of DQ made in 3D Dot Heroes. 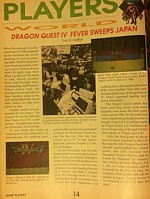 Big writeup about Dragon Warrior I.